Each folder in Datamolino can be connected to an organisation in Xero. You can also connect multiple folders to the same Xero organisation. Usually, one folder should be used for one company. For larger companies, you can have one folder for each company location or each department, depending on your workflow. Xero allows you to manage multiple companies as Xero organisations, the folder in Datamolino is equivalent to that. Folders can easily be shared amongst users. Just click “invite user” type in an email address and the folder is shared. If you invite an existing Datamolino user (with the email that he used to create his account), the folder appears in his My Folders dashboard. When you invite a new user, he will get an invitation email to create a Datamolino account and will have access to this folder once he creates his account. Each folder has a unique email address that you can use to forward invoices that you receive in your mailbox. You can also set up your scanner to scan directly to your folder using the folder email address. This feature comes in handy if you have a scanner with a feeder. Datamolino can split multipage scans into individual transactions. You can just scan a batch of invoices, email it from the scanner to Datamolino and we do the rest. It is easy to work with the folder. Each transaction that has been exported to Xero has a little green Xero badge. Everything that is still waiting for export has the status “ready”. Click the “Ready to export” tab on top of the invoice list to filter out only the invoices and receipts that are freshly processed and ready for your review and export to Xero. Datamolino also detects duplicates on the file level and data level. A "file duplicated" is not processed automatically. This helps you when you upload the same file twice by accident. A data duplicate compares the "supplier name" and "invoice number" and flags a duplicate if these values match. You can also use the search function in the top bar to filter and search in your folder. There is no need to archive transactions from the folder. Just use the “Ready to export” tab to see new invoices, or use the date filtering feature in the search bar to work with transactions that interest you. How long does it take to have the data ready? Datamolino is an automated service; we give you the results within a couple of minutes once Datamolino has learned how to read the invoices of your suppliers. The learning process is taken care of by our operators during business hours. If you upload new invoices that we need to learn, we try to process them on the same day, if you upload them in the evening, you should have your results before lunch on the next business day. Once Datamolino learned to read the supplier invoice, the next time you upload an invoice from the same supplier or with the same layout, it is processed automatically within a couple of minutes (depending on the server load). To get you the best data capture results, the quality of your original documents is very important. Digital PDFs and 300 DPI invoice scans give the best results. Phone picture snaps of papers on your desk cannot be automated. Datamolino gives you the basic data that you need to process the invoice even on invoices that cannot be automated, we just process them manually for you. This means that you will need to wait for the manual process to finish. For best user experience, upload good quality scans or digital PDFs. As a rule of thumb, if the scan has a low print quality or has handwriting that interferes with the data, our robot will have a hard time picking out the correct data for you. When you create a folder, you are prompted to connect the folder to your Xero organisation. If you have not done so, please connect the folder to your Xero so you can proceed with the data export. Just click on the split button “down arrow” of the “Export” button to reveal a menu and choose “Connect your accounting”. After you are connected, you can use the dropdown to refresh Xero data like ledger accounts or contact details. 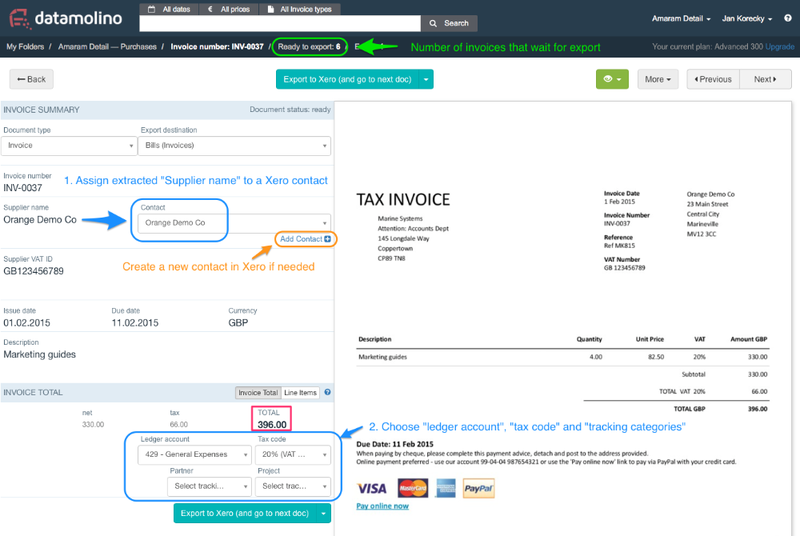 For the first time export to Xero you need to pair the supplier names on the invoices with your contacts in Xero. Datamolino remembers the pairing for future use. You can do it in the invoice detail by clicking on the dropdown next to the supplier name. You can also create a new supplier contact directly from Datamolino by clicking on “create a new contact” under the drop-down menu. All drop-down menus are searchable for your convenience. To finalise the export just select the “ledger account” and “tax code” and if needed, your “tracking categories”. 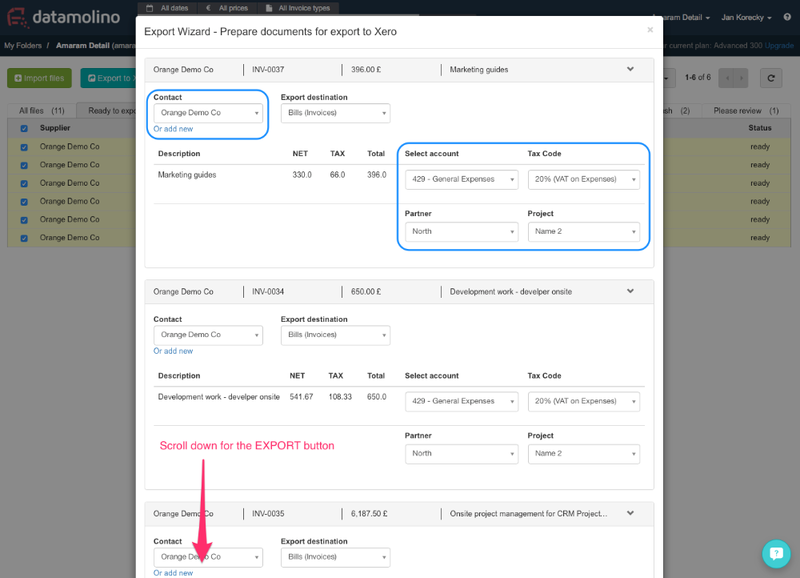 Click the “Export to Xero” button to send the data to Xero. Please note that Datamolino will send the “Total” of the invoice and Xero will calculate the tax based on the “tax code” setting that you have chosen. Datamolino will remember the “supplier name / ledger account / tax code” combination and suggest it to you the next time you import invoices from the same supplier. This means that the “hard work” of choosing the coding happens only for the first time in the folder, on the next export you only need to review the settings and adjust only when necessary. Alternatively, you can export multiple invoices at once. From the invoice list in the folder, just click the checkboxes next to invoice you want to export. You can also click the checkbox on the top left to select all invoices on the page. When you click “Export to Xero” an export pop-up window will appear that will let you adjust the “contact / ledger code / tax code” for each invoice and export multiple invoices at once. This is a good choice if you know the extracted data to be correct and do not need to adjust the figures or invoice descriptions. Our clients usually prefer this method of export for supplier invoices that have been uploaded as digital PDFs or where the scan quality reliably gives good results. By default, Datamolino exports all your data to the “Xero Draft Bills” together with the original invoice image. You can change this in the "Folder Settings". Data can be exported to "Bills" as "Draft", "Awaiting Approval" or "Approved. // You can send the data also into transactions of your bank account. You can choose this option in Supplier Automation or Folder settings. If you use Xero Cashbook, choose this option. To access the "Folder Settings" click on the folder name in the blue navigation bar on the top right of your screen. You can control the access to your folder in the Folder Settings. Remove users from the folder or invite new users. "Administrators" will be able to invite and remove users and work with folder data. "Users" will be able to import and export data only. Datamolino can split multipage scans into individual transactions. Scanning invoices one by one takes a lot of time. With Datamolino, you can scan the purchase invoices in batches. All you need is a scanner with a feeder. Set your scanner to email the scan directly to your folder to save even more time. The scans can contain multipage invoices, and we can still split the scan correctly. // Technical note: for quality control reasons we review the splitting of multipage scans that have less than 10 pages (it could be only one invoice). Scans that have more than 10 pages are split automatically. Unrecognised invoices are stopped for a fingerprint. Also, documents surrounding the unrecognised invoices are stopped to check if it is not the same document. Some invoices contain multiple tax rates. If the "tax summary" is printed on the invoice, Datamolino tries to capture it. This can give you one line of data for each tax rate. You can try this by clicking "Tax Summary" option in the document detail and see if we have captured it. You can also easily add another line of data if needed. Special usage: if you need to break down an invoice into multiple lines, you can click "add tax line" when you need to create a new line on the invoice with a different ledger code (but without possibility of changing description per each line). Line item extraction - gives you a boost for that special client Datamolino can capture every line of invoice data. Available as the "Detailed user plan" this feature gives you the ability to copy the invoice line by line into Xero and assign each line item a different nominal code and tracking category. It also allows you to split the line items into different tax rates. In addition, each line item contains different description as per invoice. This is great for invoices where you receive different products or services. You can send the invoice data to you Bank Accounts in Xero as "spent money" or "received money" transactions. In the Folder settings scroll down to "Direct Connection" and choose "Bank transactions" in the setting for "Export invoices as drafts or bank transactions." Search and filter - helps you find that elusive invoice. Use the search in the top bar to find invoices. The search can find indexed keywords, such as supplier names or invoice number, but it also works as full-text search. You can also use it to filter by dates or by invoiced amounts. Dedicate a team member that is responsible for uploading documents to Datamolino. Your colleagues that will do the invoice coding can pick up the invoices directly in Datamolino. This saves additional time. Previously, everybody had to pick up his stack of documents, sort them and enter the data into the system. After data entry the paper documents needed to be filed into a folder and put into archive. If one person is responsible for digitising documents, the rest of the team does not need to waste time with moving paper around the office. Datamolino finds various data points on each invoice, not all data is used for export into Xero. With line items, we export the TOTAL as tax inclusive. If the line item on the invoice has only NET values, we find and export only NET values as tax exclusive. Xero applies the tax rate from the "tax code" setting and calculates taxes in the background. You can always export data into Excel or CSV by clicking the "down arrow" on the export button and choosing "Export to file". You can always export data into Excel or CSV by clicking the "down arrow" on the export button and choosing "Export to file" and then "Original files". What type of files can you import - PDF, TIFF, JPG, PNG, and ZIP. You can also send emails with html receipts. Update August 2018: Datamolino supports also DOC, DOCX, XLS, XLSX formats.